Don’t be thrown off by the name of this online pokie – it isn’t all Disney princesses and butterflies. This Golden Princess pokies machine offers an interesting take on what it was like to be royal in Mexico in the 14th to 16th century. Since this Microgaming video slot is set in Ancient Mexico, we get to enter a world where we own tigers and jaguars all the while on a quest for gold. On an adventure into the culture of the Aztecs, we find ourselves learning about Ancient Mexican civilisation, scoring some great bonuses along the way. While there are drawbacks to the game which we highlight, it has some appealing draw cards including several bonus features as detailed below. 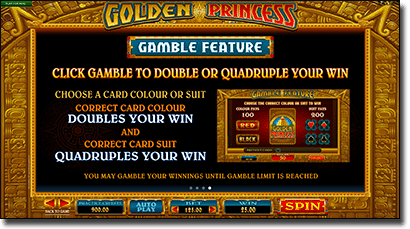 The format of this slot is the traditional video slot format, featuring 5-reels and 25 paylines. Despite being a online pokies machine, there is no video introduction like many slots have in order to tell the story; rather, we are taken directly to the reels. The story can be deciphered via the graphics of the native Aztec woman and man, as well as through all of the symbols. Wins occur when symbols appear next to each other on a payline, and can be multiplied depending on the combination and what symbols occur. Players can win up to 125,000 credits with 50,000 coins up for grabs in the base game. Overall it is a standard format with a good jackpot available and with Microgaming’s 95-96% payout rate this slot has potential for wins. Scatter symbol – The scatter symbols are represented by Treasure Chests and when three or more appear the free spin bonus round is triggered and the more that appear the more free spins you get. Wild symbol – The wild symbol is represented by the Aztec Temple and replaces all symbols except of the scatter symbols. in the free spin round they can appear stacked in order to fill up a reel. 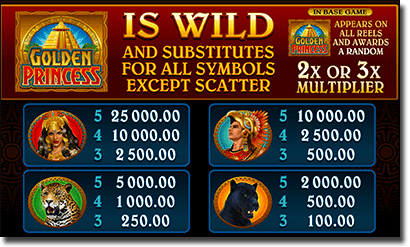 Multipliers – The multipliers are known as mystery multipliers which occur in the free spin bonus round as scatter symbols. So when you see the scatters in this free spin bonus you are getting mystery multipliers which will transform. These multipliers can be from 2x right up to 10x of your bet. If players land three to five scatter symbols then they will win 10 to 30 free spins, respectively. While free spins can’t be won again while you are in the bonus spin round the more you get before you enter it the more free spins you get in that round. Additionally, there is a bonus payment when a scatter does appear during this round which exists as a multiplier as mentioned above. Unfortunately, this slot does not offer a bonus game rather they focus on the gamble option. This can be considered quite a draw back but for those who like the gamble feature it may be seen a positive. Microgaming’s exciting addition to many of its slots includes the gamble option where players can gamble any winnings by picking the colour of the card (red or black) to double their winnings, or by picking the suit of the card (diamonds, hearts, clubs, or spades) to quadruple your winnings. However, if you don’t guess correctly you will lose all your initial winnings but that’s why it is called the gamble feature. We don’t love that there isn’t a bonus round, rather there is only free spins to score; nor do we understand the title in association to the theme (something along the lines of Golden Aztecs probably would’ve been a better fit). Regardless, the jackpot coins on offer make this a worthwhile pokies and the gamble feature is definitely a thrilling addition. The free spins are also a nice little addition with up to 30 free spins taking this standard pokies up a notch. Overall, this slot machine is worth a spin but we recommend only playing it at a casino which is reputable otherwise you may not be playing it to its full potential. 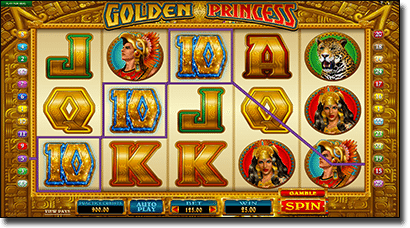 Playing at a trustworthy online casino is incredibly important so we have found the best place that offers the Golden Princess slot machine for you to try. Royal Vegas Casino offers the title in both free play and real money mode so you can try before you deposit and ensures its players are protected by using data encryption technology that allows you to play with real money without having your personal details compromised. New players signing up for an account at Royal Vegas using our links can claim a welcome package of up to $1200 in matched deposit bonuses.